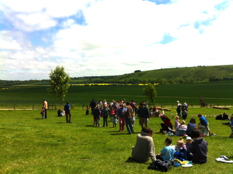 Sunday 9th June 2013 saw a Nationwide “Open Farm Sunday” organised by LEAF (Linking Environment and Farming), at Wexcombe we joined in by opening our farm from noon until 3pm. With a lot of help from many within the parish, a fun family occasion was organised. Over 200 people came along (including an unannounced visit from Caroline Drummond the head of LEAF!) and we were blessed with a perfect sunny day. A Farm Discovery Trail provided a short route with12 different ‘attractions’ to find, from tractors and machinery to rams, lambs and chickens as well as ponies and the calves. An information sheet at each point helped to teach the children about the role of each of the ‘attractions’ on the farm today. A BBQ of local produce, including Wexcombe Beef, cooked up a roaring trade, all but selling out! Plant, Cake and Ice Cream stalls also went incredibly well. 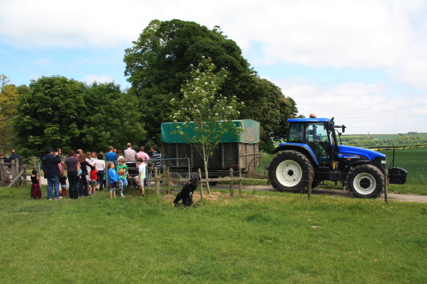 There were children's races run over bales with edible prizes and the high demand meant six Tractor & Trailer Rides took visitors around the farm, proving to be a real hit with the kids and adults alike. With the brilliant turn out and our wonderful volunteers, we raised a fantastic £1129 for the St. Nicholas’ Church Roof Fund. 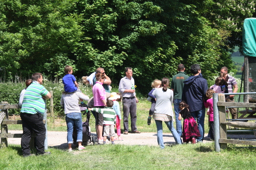 Sunday, 7th June is the date for Open Farm Sunday this year. We will be open 11am to 3pm. Click on picture to visit the national Open Farm Sunday home page. We also host School Visits throughout the year.